Security Analytics is one of the two fastest growing product categories in security. Unlike sand boxing for advanced malware detection it provides a comprehensive view into all network traffic, not just payloads. Every organization will have to deploy some sort of security analytics. The largest IT departments in highly targeted environments, like banks and defense contractors, are already doing some sort of security analytics. The enterprise is hiring the talent now to be able to deploy and use security analytics. Smaller organizations will have to use managed service providers because they lack the staff. There will be stand-alone tools, cloud tools and capabilities built into network security platforms. Scale, speed and ability to apply security intelligence will be the determining factor in the success of these tools. 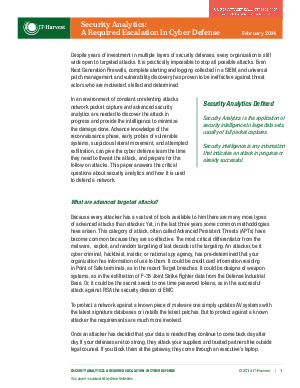 Security analytics is an emerging requirement in the ongoing arms race with threat actors.